Our Amazing Looks model contest winner, Hayley, is ready for a summer soiree with these carefully selected pieces that add up to sophisticated summer style. In my book every gal should have a black tank or t-shirt that has sparkle. This black sequined silk/nylon tank from Field Manor was a perfect way to start due to it’s simplicity. That allowed me to go for the artisan watercolor print green, gray and black skirt from The Limited as our focus. The understated, muted colors work well with the subtle shine from the tank top. We were able to really load on some cool accessories because of the subtle tones of the rest of the outfit. So, on went the dramatic black feather earrings, the green boho pendant necklace and multi-color bracelet. Her shoes are a great illustration of transition pieces as well. The black patent Mary Janes by Calvin Klein, work for summer without hosiery and will take her through fall and winter with the addition of tights. This is a classy, young and fresh look that hits all the right style details. Colorful is the key to model Damara’s layered summer look as well as her warm personality. Incorporating patterns and colors is sometimes intimidating, but it really works here. We kept everything in the outfit close to the tones of the fantastic high-waisted print skirt from Merona. Instead of “matching” the pink tones, I focused on accenting the secondary colors. The yellow- -and-white striped halter top from Loft works well with the length of the skirt and has a fresh feeling. 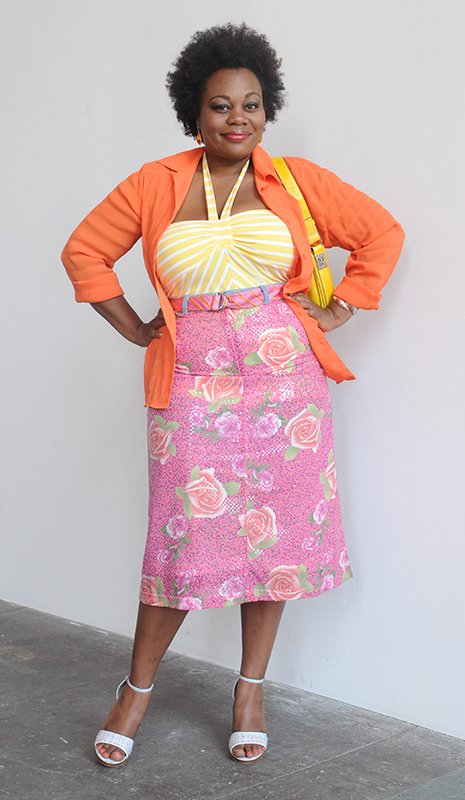 I layered a sherbet orange top by Cole Ridge over it for that complementary pop of color. Keeping the top solid was strategic to grounding the vibrant floral print of the skirt. For fun we added a striped grosgrain belt from Old Navy, a silver bracelet, and some orange earrings in a small scale. You don’t want big accessories with this much color. Topping it off is a citrus yellow New York & Co. handbag, and textured multicolor-woven fabric heels by Bango. This is a spectacular summer look for anyone! It also illustrates my mantra, which is items that go together, but do not match exactly, are what makes any great outfit really work!